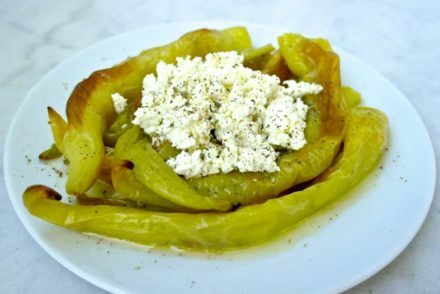 In Greece we often eat cheese with fruit. Mostly it is feta: Feta with cantaloupe, feta with grapes and of course feta with watermelon. Not really a fancy salad, just a chunk of feta and some fruit. Usually it’s as a quick snack or after the evening meal. Nutritionally you can say it is a well-rounded meal, carbohydrates and fiber from the fruit and protein and fat from the cheese. But I find it a perfect meal for those hot summer days when you do not want to cook, let alone turn on an oven. 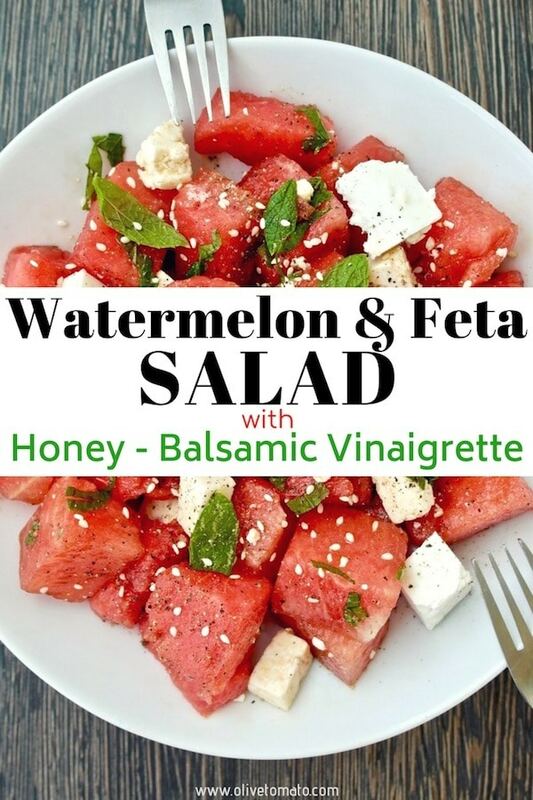 Watermelon in particular is a great source of lycopene a potent antioxidant, as well as vitamin A and vitamin C.
While watermelon and cheese is tasty, if I have it for a main meal I like it to be bit more fancy and make something like this watermelon and feta salad with a vinaigrette. I added fresh mint which is growing like crazy on my balcony, mint is often used in Greek recipes that include feta because it complements it so well. I also added sesame seeds and a vinaigrette made with a bit of olive oil , balsamic vinegar and a touch of honey. 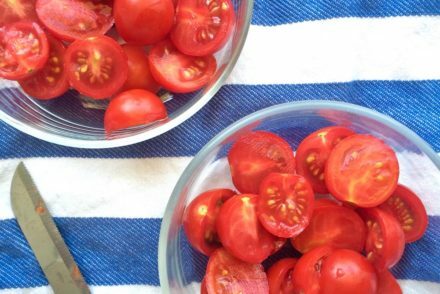 This salad combines sweet and salty perfectly. As with other salads, I found this to be more flavorful after sitting in the refrigerator for an hour or so. The watermelon remained crunchy but infused with the vinaigrette. You can drain the juices before serving as the watermelon will release some fluids, but I didn’t and dipped the chunks of watermelon in it. 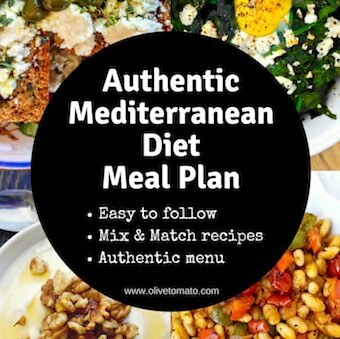 I had this for lunch and it was very satisfying, but it is also wonderful accomniment to chicken, pork and lamb dishes. Speaking of crunchy watermelons, as with most recipes you want to make sure your main ingredient is top quality. This recipe would not turn out very well by using a mushy watermelon or an unripe one. There are a few secrets to buying a watermelon. Here in Greece once June comes around you will see small trucks on the side of the road loaded with watermelons and everyone has there tried and true tips on getting a good one. 1. Look at the white spot. That is the part that was touching the ground. It should be a creamy yellow rather than totally white, that means it is ripe. 2. Look at the stalk. The stalk should be dry not green. If it is green it means it was picked before it ripened. 3. Check the skin. Pick a watermelon with fairly smooth skin, and there should be no part of the skin that is soft. 4. Hold it. The watermelon should feel heavy for its size. 5. Tap it. It should have deep sound not a hollow one. 2 cups watermelon pieces cut in cubes. 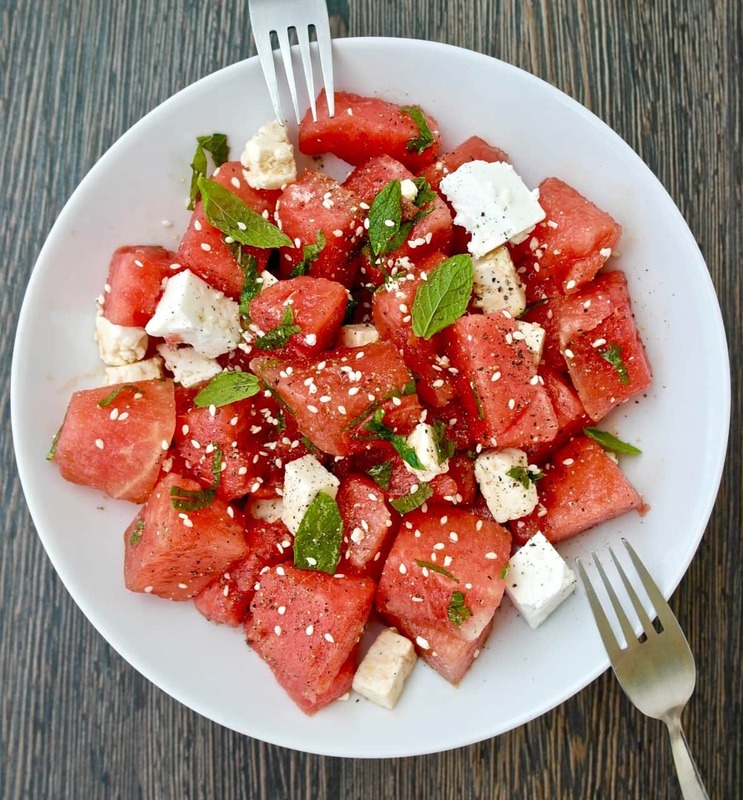 Place the watermelon, feta, mint in a bowl and toss gently. In a small bowl mix the olive oil, vinegar, honey and a pinch of salt. Drizzle on the salad and mix. Sprinkle with sesame seeds and add freshly ground pepper. Cover and let it sit in the refrigerator for an hour before serving. I didn’t have any watermelon or balsamic vinegar on hand, so I substituted cantaloupe and rice vinegar and it was delicious. Thank you for an awesome recipe! Can’t wait to try out others. Pairing feta cheese with watermelon is a classic combination in Greece. I find that I don’t always need dressing on this salad aside from a little olive oil, but this balsamic vinaigrette is a nice change of pace! 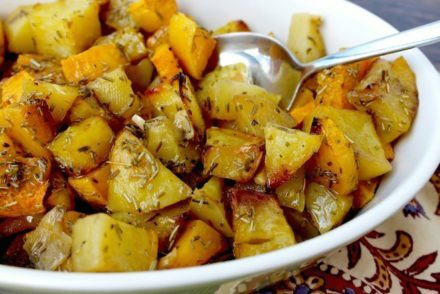 The honey in the vinaigrette really gives it something special.